I’ve gone back and forth about whether to write a wrap-up post for our time in Borneo—normally I only do these for countries (which Borneo is not, made up as it is of three different countries) and much of what I have to say about Malaysian Borneo is true for Malaysia as a whole. Then again, there were a few things about our time in Malysian Borneo that were rather unique, and I do think that spending patterns are sufficiently different between the two regions that one’s approach to planning and budgeting time in Borneo would be different than spending time in peninsular Malaysia. With that perspective in mind, I decided that it would be worth it to separate out and share our costs for traveling in Malaysian Borneo, but will save a full-blown “Everything You Wanted to Know” style post for when we’re finished discussing our time in Malaysia proper. 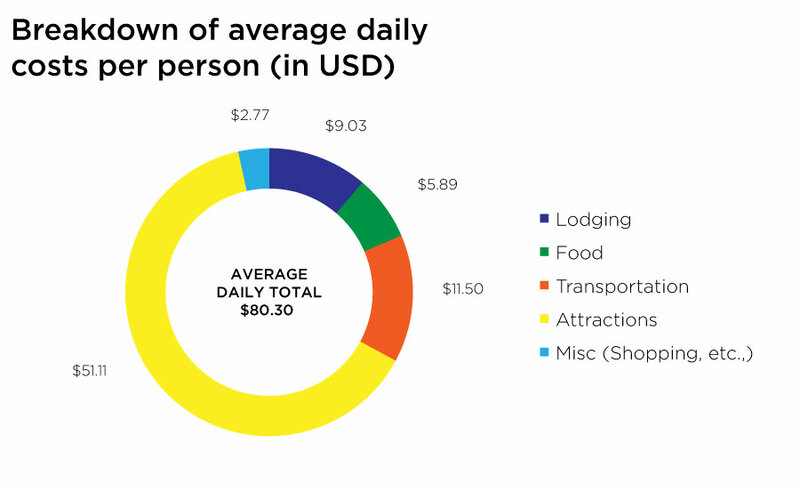 Projected Daily Budget, per person: Our overall trip budget is $50/person, so we were $30.30 US (per person!) OVER budget! I’m not going to show the plot of our daily spending because our time at Sipadan skews the scale so much as to make it difficult to really appreciate just how much it varied from day to day. Instead I’ll say that there were days where we spent as little as $9.50US per person, and—even with our Sipadan days removed—there were other days where we spent as much as $86 US per person. So, clearly our spending in Borneo was all over the place, which I think highlights just how difficult it is to anticipate an appropriate budget for traveling here. As a general rule of thumb, I’d say aim high. A Note On Daily Costs: In our daily costs, we have separated out the cost of our transport into Borneo. We did this because we believe that including the price of getting into or out of a country results in a figure that does not accurately reflect our actual day-to-day costs. Moreover, not everyone will choose to enter the country in the same way or from the same departure point as we did, so we include the price we paid separately for your edification. We believe our Lodging, Food, Transportation, Attractions, and Miscellaneous Shopping costs are reasonable estimates that may be informative for other like-minded travelers; however, we believe the cost of our transportation into any country is best considered a separate lump sum expenditure, and we will continue to treat it as such. Accommodation: Although $9/day per person doesn’t seem too shabby, this value might be a bit on the low side for most travelers, for a few reasons: 1) We CouchSurfed 4 nights while in Kota Kinabalu; 2) When diving at Sipadan all of our costs (food, lodging, diving, transport) were lumped together, so we don’t really have a lodging estimate for those days. Same goes for when we did the Kinabatangan river cruise, when we just paid a package lump sum. On the other hand, we did celebrate my 30th birthday while in Borneo, so we splashed out and spent 2 nights at a fancy resort that cost $40/per person/night so that might balance things out a little bit. To be on the safe side, I’d probably suggest budgeting $15/day per person for lodging. In general, I’d say that lodging in Borneo is a bit on the pricy side (at least compared to the rest of Malaysia), particularly if you’re a couple who prefers private rooms to dorms. We weren’t really looking for hostels while in Borneo, but I got the impression that there aren’t really that many anyway, and you’re more likely to stay at guesthouses and hotels. Be prepared to be flexible, as we tried out the gamut of lodgings while in Borneo, from dorms, to swank resorts, to places with shared bathrooms… you get the picture. Most of the places we stayed were fine, but quite basic and generally unremarkable. Food: Have we ever spent so little on food in any destination? Again, this estimate might be slightly lower than others will find due to the aforementioned Sipadan & river cruise lump sum issue, and also because our CouchSurfing host cooked us up several delicious meals for free. That said, food generally was quite reasonably priced in Borneo, as it is throughout Malaysia. I would say that it is not unreasonable to plan on spending about $3-4US per person per meal, but rarely would you ever spend more than that. I will say that although prices were comparable to the mainland, neither Tony nor I were particularly blown away by the food we had in Borneo. 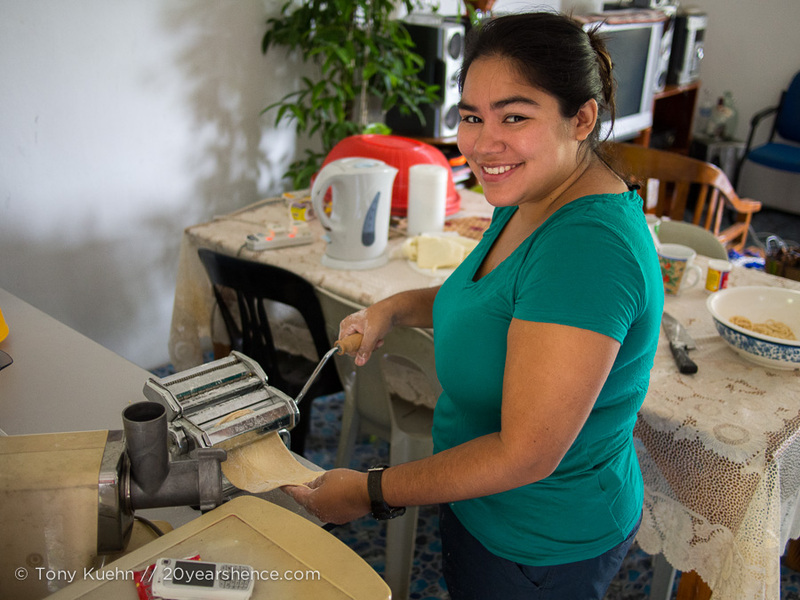 On the whole I would say the food is better on the mainland, although the home-cooked meals we had really were fantastic. Transportation: Our first budget buster appears. Unlike the mainland, it’s a huge pain to get around Borneo, which is perhaps not to be unexpected when you’re dealing with an island that is largely untouched jungle. Considering the distances covered, the buses are not especially expensive, but they are incredibly time-consuming. 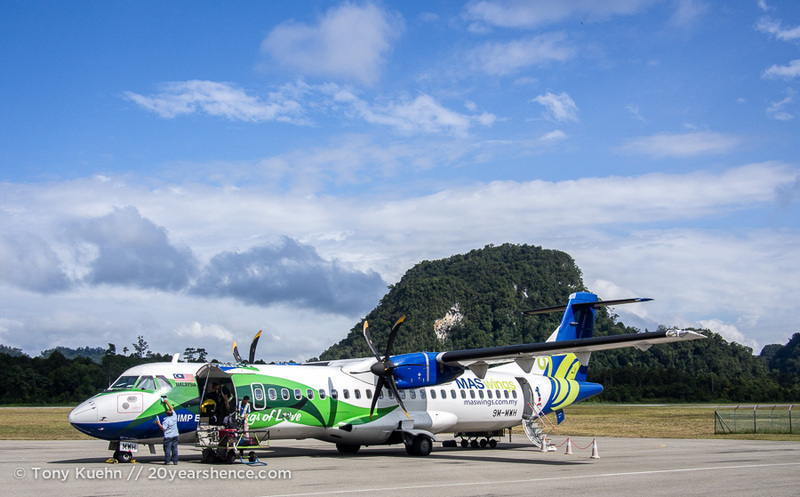 We had just over three weeks to make our way from Kota Kinabalu to Sarawak, so we wound up taking three domestic flights during our time there (Kota Kinabalu to Tawau (to dive Sipadan), Miri to Mulu, and Mulu to Kuching). At around $45/per person for each of these flights, they definitely inflated our travel costs, though given the time savings (and added comfort) they provided, we are happy we did so; they prevented us from doing a lot of backtracking and they salvaged three days of our trip for us that would have otherwise been lost solely to transport (possibly more, as accessing Mulu overland can take three or four days!). Ironically, if you are coming from Malaysia, it’s actually not that expensive to reach Borneo. Air Asia runs plenty of flights to Kota Kinabalu and Kuching (as well as various other cities), and it’s rare you’ll pay more than $50US per person (and possibly far less if they have a special promotion, which they usually do). Obviously we didn’t get the greatest deals on our flights, but we bought them less than a month before our visit. Attractions: Our major outlay and by far the one area that will really destroy your budget while in Borneo. As you can see, we spent nearly 75% of our budget on attractions while in Borneo, probably an all-time record for us. Again, this value might be slightly inflated because we logged our pricey diving and (not-so-pricey) river cruise packages under this category, however, I think it’s accurate to say that attractions are really quite expensive in Borneo and will definitely cost more than you expect. We reasoned that the reason we visited Borneo was to experience the natural attractions it had to offer and we were willing to pay for that privilege. Although there are some cheap activities to be done around Kuching and Sarawak, most of the big-ticket items will cost you a pretty penny. And let’s be honest, you didn’t go all the way to Borneo to hang out in the cities and museums and not see the wildlife. If you’re a diver, you could probably still shave a little bit off our daily total if you choose to dive with someone other than SeaVentures. If you’re not interested in diving or doing any kind of rainforest trekking deep in the heart of the island, then you could safely cut this in half; just be aware the any kind of adventure or cultural activity will probably cost at least $30US per person. I didn’t fully realize until I started writing this post just how much money we spent during our time in Borneo. I had always known it was pricey compared to the rest of Malaysia, but hadn’t realized exactly how expensive it was. I certainly didn’t anticipate that we were spending the same amount as in JAPAN, but the numbers don’t lie. When you’re spending $80US/day per person and are therefore $30 over budget, it’s hard to gauge whether Borneo is a good value destination, especially when so many nearby countries are so much cheaper. It’s almost redundant to say we had an amazing time in Borneo, because although that’s definitely true, for the price, you’d certainly expect nothing less. Still, we really did have a lot of unforgettable, once-in-a-lifetime experiences that are hard (but not impossible!) to put a price tag on, the kind of experiences you can’t really have anywhere other than Borneo. Seeing wild orangutans, cruising down rivers and spotting pygmy elephants, visiting some of the best caves in the world, staying on an all inclusive dive rig in the middle of the Celebes Sea and being cocooned by swirling schools of jackfish at one of the world’s best dive destinations… few of those things were cheap, but neither of us would trade any of those moments just to have a bit more money in our travel fund. Indeed, I think we’d argue that those are the very moments that tend to be the highlight of most travelers’ RTW trips. Undoubtedly we could have traveled through Borneo for far less, but that would have meant experiencing far less as a result, and I’m not sure the trade off would have been worth it. 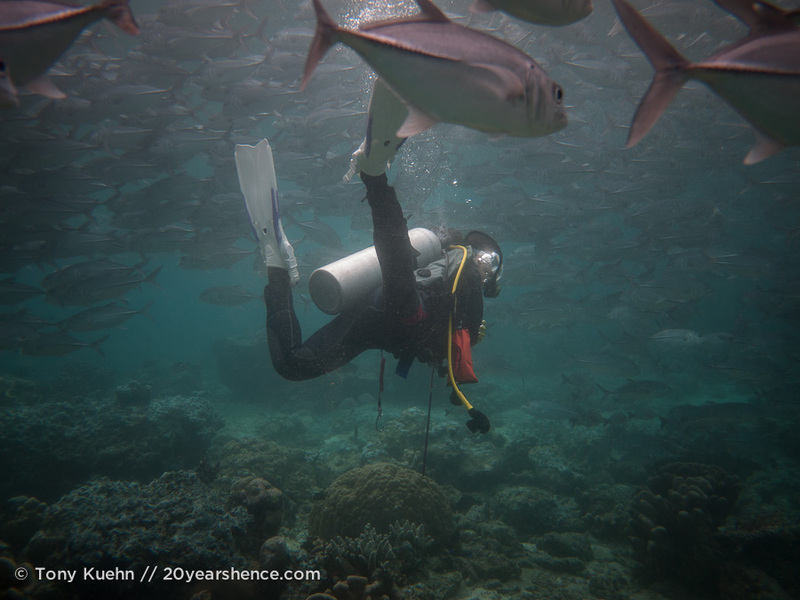 We’d both love to dive Sipadan again some day, but we might pursue a more budget-friendly route next time around, which would dramatically reduce our daily costs. Neither of us has any regrets about the time we spent in Borneo, except we wish we had more of it! It’s probably best for the sake of our travel fund that our time was limited, but when locals laughed at us when we told them only had three weeks and informed us we’d barely have time to explore one province never mind two, they were correct. We wound up spending most of our time in Sabah province, and had to squeeze in Mulu and Kuching in Sarawak within one week. From the little we saw, we personally felt that Sarawak had more of the untamed, untouched vibe going for it and it felt more like the Borneo we had dreamed up in our heads (it’s definitely the more difficult province to travel around). We really enjoyed all of the activities we did in Sabah, but we both wished we had devoted a little more time to explore Sarawak. So, is a trip to Borneo expensive? Probably for most people the answer will be yes; it certainly was for us. I don’t pretend that this is a destination that couldn’t be done for less money than what we spent, but then again, I wonder whether you’d really want to visit it that way. I can’t believe it cost you as much as your time in Japan! Borneo has been on my list for a long time now, but seeing your budget breakdown makes me realise that it was probably a good thing that we never got there last year – I’m not sure we could have afforded it! Although I probably wouldn’t go diving, I would definitely want to do the animal experiences and not couchsurfing would definitely seem to bump up the accommodation prices. Good to hear that food isn’t overly expensive, but again, not sure I’d stay for too long if it isn’t as good as mainland Malaysia. I was really surprised by the numbers too! I will say that we really did go for the most expensive diving option that was possible, and that cost us A LOT and really bumped our budget up. But I think the general consensus from other travelers who have made it to Borneo is that it ain’t cheap. 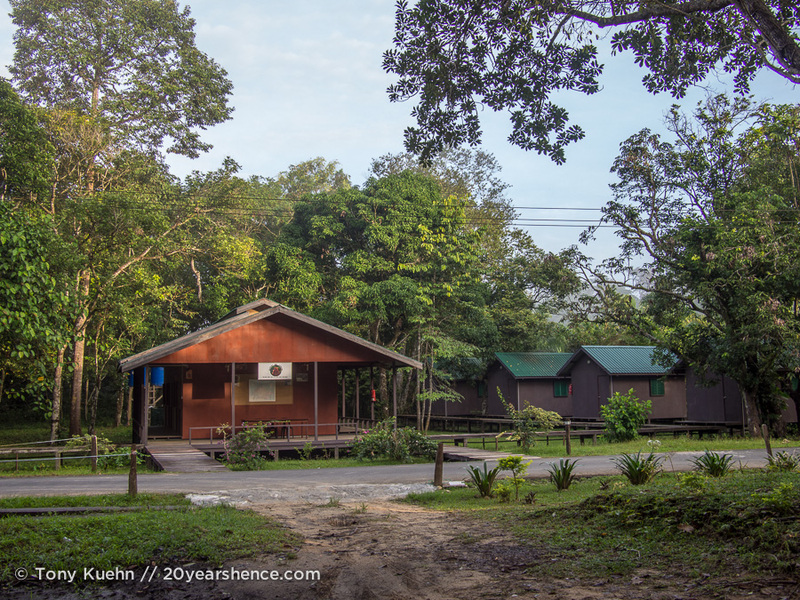 You could certainly do it for less than we did, and things like our Kinabatangan river cruise were actually very affordable, but if you really want to take advantage of what Borneo offers, you will have to bump your budget accordingly. It was worth it for us, no regrets, but we probably couldn’t have afforded to spend any more time there than we did. I nearly went to Borneo when we went to Malaysia a couple of years ago, but the costs for everything seemed so high that we decided to postpone our visit. I’d still love to go as it sounds like an amazing place. It really is incredible, and I think we felt that by and large, the high prices were worth it. But I don’t think we really anticipated just how much more expensive Borneo would be compared to peninsular Malaysia. Some of these things were definitely once-in-a-lifetime, I think! Looks like you’ve really crunched the numbers here – an interesting breakdown, especially the graph you did. Lovely pictures too! Glad you enjoyed and found it useful! It definitely hurt a bit to look at these numbers and realize how much we spent, but we figure there is no point hiding our costs, as this way people who are interested in visiting Borneo will know what they are in for! This was definitely one of our pricier destinations to date, but we had a great time! This is a great post – even if it is more expensive it prepares me for that sort of mindset (sometimes you just gotta shell out!) to experience those exact same once in a lifetime experiences!! Yes, sometimes you really do have bend or break the budget otherwise there’s really no point in traveling. We routinely come in under budget in most of our destinations, sometimes by 3 or 4 times, so that allows us to keep perspective and remember that the goal of our trip was to see the world, not to do that as cheaply as possible. Why go to Borneo only to miss all its attractions because they’re too pricey? There’s definitely a time and a place to cut corners and be frugal, but Borneo isn’t really one of them! Definitely a dream destination for me! Do you know if it is it possible to visit Sepilok Orang Utan Sanctuary by yourself, with no help of tour operator? Just to arrive on the spot and buy a day ticket or book the night in any lodge straight there? Hey Steph! i was really happy to find this blog as my girl and i have just booked flights to Borneo, leaving march and we wanted to get an idea as to how much we should budget for the trip. We’re both avid divers and spiadan is a must do for us, as well as all of the wildlife etc, we were thinking around $150 a day for the entire trip (considering how expensive the dives are at sipadan, and the permit costs for kinabalu etc) we may revise this down slightly after you blog. Can you possibly give me figures for exactly how much it cost you to stay and dive in sipadan, how long you stayed for, how many dives you did, and where you lodged exactly? Any info would be great. Hi Lucas! We actually wrote a post about our Sipadan experience, so you can read all about that here: http://www.20yearshence.com/into-the-blue-diving-sipadan/ It has information on what we paid per day, how many dives we did, and what we thought of the diving in general, etc., If you have any other questions after you read that, let me know and I’ll answer them as best I can! Diving Sipadan was definitely our big splurge in Borneo, though you could certainly dive it for much less than we did. Since we were still newbie divers, we wanted to make sure we were diving with a quality operation; although Seaventures was pricey, it was an amazing experience that I would happily repeat in the future! In this case, you certainly get what you pay for. If you get the chance to dive Sipadan on your trip and can afford Seaventures, I highly recommend it. Borneo in general is a fascinating place, though certainly not the cheapest destination in Asia. Since we actually averaged about $160US total for the two of us per day, I’d say $150US for the two of you is probably a safe estimate if you’re planning to dive and climb Kinabalu. That is a great write up on Borneo and budgeting. Feel quite informed. Thank you so much as considering London-Jakarta-Bali-Borneo-Singapore-London early part of 2017 for 2months or more. Is there a beach life you could recommended connected to some nice wildlife treks? And have you by chance travelled through Sumatra. I’ve trekked in Guatemala, Nepal, Sri Lanka, India, Laos, Cambodia, Vietnam, Thailand and Great Britain and got quite remote and wild in the past. Will Borneo blow me away? Is it the truly lush tropics? Will look out for on Instagram for you.